Last weekend I had the pleasure of exploring the MET's Heavenly Bodies Exhibit. 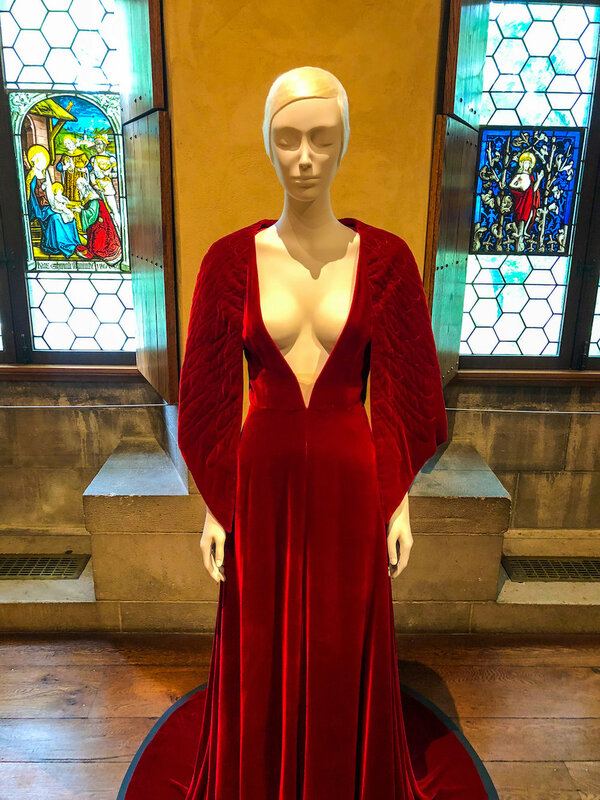 It is the Costume Institute's 2018 collection on display in New York City. This is the MET's largest exhibit to date, so large that it takes place at both the MET 5th Avenue and the MET Cloisters, north of Manhattan. If you've never had the chance to explore the Cloisters, this exhibition is a great excuse to make your way up there. I think seeing both spaces is vital to understanding the exhibition as a whole thought. Heavenly Bodies explores "fashion's ongoing engagement with the devotional practices and traditions of Catholicism." It investigates the influence which religion has had on the cultural imagination as well as the ways in which it directly impacted the visions of fashion designers. Throughout the exhibition, there is no audio guide or a detailed map to direct you towards a starting or finishing point. I've created my own guided tour to help you discover what you'll see where. I've broken this guide up into three different parts, to read up on the other two parts of the exhibition click the following links: MET Vatican Collection | MET 5th Avenue. General admission to the museum is $25 for adults; $17 for seniors; $12 for students. Your admission includes all the exhibitions and is valid for three consecutive days at The Met Fifth Avenue, The Met Breuer, and The Met Cloisters. So if you're planning on attending both the MET 5th Avenue and the Cloisters just keep your sticker and receipt and you won't have to pay again as long as you go within three days. You can buy your tickets online if you don't want to wait in line when you get to the museum, which during these popular exhibits is recommended. The MET Cloisters is open seven days a week. Sunday–Thursday: 10 am–5:15 pm and Friday and Saturday: 10 am–9 pm. The best way to get to the Cloisters is to take the A train to 190th Street Subway Station. From the station, it is a beautiful walk through the Fort Tryon Park. The park is a peaceful oasis from the busy city and provides stunning views of the Hudson River. The signage for the Met Cloisters is a bit sporadic but keep walking north and you'll reach it eventually. Part of the journey to the Met Cloisters adds to the feeling of pilgrimage which curator Andrew Bolton thought was a key part of the exhibition design. A pilgrimage "is a journey of spiritual significance, typically to a shrine or other location of importance to a person's beliefs and faith." For many, fashion is as spiritual as religion is for others. It allows them to express their creativity, their passions and their joy. 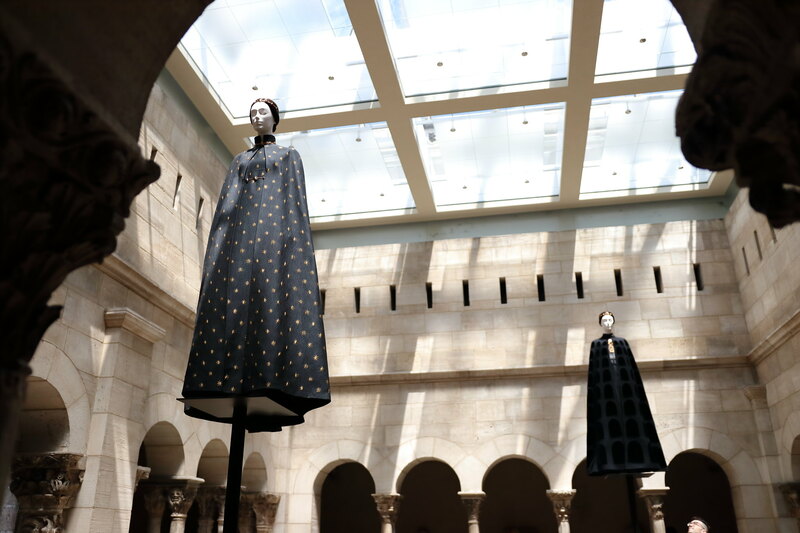 The Heavenly Bodies collection at the Cloisters focuses on the quiet, reflective nature of faith. The outfits are more complicated, require more thought and observation, and due to the remote location, allows you to have a more personal experience with the objects. Since the journey to the Cloisters isn't a short one, less people seem to make their way out here so you're viewing will be much less crowded than perhaps at the Met 5th Avenue. What many might not know about the Met Cloisters is that it is not simply just an old building in the middle of New York but pieces of ancient medieval monasteries, brought stone by stone to the United States, where they were fitted together in a jigsaw-like fashion, to create this patchwork quilt of a structure. George Grey Barnard, an American studying in Europe in the 1900s, made a living buying and selling medieval treasures which unknowing landowners found on their farms. But the discovery and beauty of these treasures became an addiction for Barnard, and as he made more and more money he would find himself buying objects for his own collection instead of just selling them all off. When he came back to the United States before WWII, he brought with him dozens of medieval relics. Barnard bought a piece of land on the northern tip of Manhattan and turned his personal collection into a museum. His aim was to teach Americans to the importance and beauty of Medieval European art. He called his church-like building, George Grey Barnard's Cloisters. The Rockefeller's bought the Cloisters in 1924 when Barnard was forced to sell but the Rockefeller's were devoted to preserving and expanding the collection. They bought an additional 66 acres of the parkland and added their own medieval architectural collectibles to the expansion. Architects were brought on to rebuild a large and more refined version of Barnard's church. Their concept was a Neo-Gothic structure, each room masterfully thought out to a house within the walls, floors and ceiling, pieces from the collection. As such, the Cloisters feel like a monastic shrine, a place for contemplation, full of rich histories. Even if the histories are from a various place, they all come together here to create this diving gem. In this majestic setting you can better understand how influential the drama and iconography of the church would have been for designers and how they were inspired from these works of art to create their own. While there is no set path for the exhibition I suggest you start in the Romanesque Hall and follow the guide which follows. I almost missed a few rooms so by following this guide, hopefully, you won't make the same mistake. The Romanesque Hall features large 12th-century frescoes from Spain as well a 13th-century stone doorway from Moutiers-Saint-Jean in Burgundy. Framed in front of the stone doorway is the dazzling dress by Viktor & Rolf from their Russian Doll collection. As an opening piece, this dress is dazzling. Covered in thousands of Swarovski crystals she shines amongst the flat stones surrounding her. On either side of the Victor and Rolf dress are two 12th-century wooden sculptures of the Virgin Mary. On either sculpture we see the Christ child sitting on the Throne of Wisdom. These two sculptures haven't been displayed together for hundreds of years, so it was special to see them together again. Despite being carved by different artists, in different cities, their design is almost identical. The Throne of Wisdom is a symbol of how Mary made Christ incarnate and without her, this child couldn't have come into the world and given humanity the gift of wisdom. These sculpture are wonderful examples of how in the 12th century the "cult of the Virgin Mary" began to develop. The Cult of the Virgin worshiped Mary in a way in which only God and Jesus has been worshipped before. Sculpture were made of her and adorned with costume and votives. In the fashion show featuring this dress, Victor and Rolf adorned their one model with layer upon layer of garments of incredibly lavish clothing. Like a reverse Russian doll. Each layer more elegant and embellished than the next. In adorning her, the clothing acted like a physical form of devotion for their muse. Directly through the doors to the right of the Romanesque Hall is the Fuentidueña Chapel. The Fuentidueña Chapel is made from over three thousand limestone blocks from Spain which form a half-domed apse. Upon the ceiling of the apse is a Catalan fresco of the adoration of the Magi. Hanging down from the ceiling is a 12th-century wooden crucifix. Staring up a the crucifix, her hands folded tenderly in front of her, is a mannequin wearing a simple, white Balenciaga gown from 1967. This room is dedicated to garments inspired or made for the baptism. The idea of rebirth is very powerful whether in a religious or secular context. The gown by Balenciaga is so clean cut and despite being located in this medieval chapel, it feels very modern. The gown is set on its own, not amongst the other groupings, highlighted by the light flowing through the stained glass windows. By separating this dress from the rest the idea of it representing a person's devotion to only singular holy light becomes all the evident. The other dresses along the walls are designed by Karl Lagerfeld for Chanel. They were directly inspired by gowns worn by girls in France for their first communion. A large stone baptismal font from the 1100s is placed within the room to give some context to these outfits, and from afar it looks almost like a baptismal scene.The fabrics which make up each outfit are pure white, mostly made of cotton, the simplest of fabrics. These refined, plain garments while not embellished or particularly eye-catching still radiate so much energy. The idea of goodness represented so powerfully here. From the chapel, step out into the Saint-Guilhem Cloister. This cloisters is located inside under a glass roof. The architectural elements in the room are made up of over 140 fragments of the Benedictine Abbey of St.-Guilhem-le-Désert in France. But what is a "Cloister" you ask? A Cloister is a covered walkway or gallery with a central open-air garden. It is the central place of monastic daily life, where monks and nuns come to pray, reflect on their daily devotions and enjoy the splendours of God's natural creations. The fashions displayed are presented on tall plinths which reach up almost to the ceiling. As if these holy inspired outfits were launching themselves up to heaven. The two garment on these plinths are inspired by the shape of classical monastic buildings. The Valentino outfit with velvet embellishments was inspired by Romanesque arches of the Colosseum in Rome. Increasingly larger and larger arches descend the length of the garment. The claps which hold the cape together are made from a golden abstraction of the image of Christ on the cross. The second dressed mannequin wears a remarkable black cape and tunic, covered in gold, embroidered stars. These stars were inspired by Byzantines images of the Mother Mary. In these portrayals, she was robed in a bright blue cape covered with golden stars. Stars are the symbol of Mary's eventual reign in heaven. The crown covered in stars added to the outfit is also slightly reminiscent of the crown of thorns. The garments are very severe, the black fabric feeling all-encompassing. They don't allow you to think of anything else, much like monastic meditations which would have been practised in Cloister spaces. From here we duct back into the Romasnques Hall and head straight into the Langon Chapel. The Langon Chapel is named for the seven Romanesque capitals from Notre-Dame-du-Bourg chapel in Langon, France which decorates the central arch. Staring down out at you from the capitals are the faces of various saints and angels. This scenes in the chapel is meant to evoke the sacrament of Matrimony. This room houses but one singular gown, a wedding gown designed for the House of Dior by Marc Bohan. The dress was made from one piece of fabric and was supposedly made from using only two seams. In reality, there were actually four but the myth is often more interesting than the truth. The use of so few seams is very symbolic since the garment which Christ wore during his Crucifixion was made with the use of one single seam. Bohan named the dress Hyménée, after Hymen, the Hellenistic god of marriage. The dress hides the face of the model with a large white veil, which resembles a nun's habit. Nun's pledge themselves in a marriage to the divine instead of another person so using them as inspiration for this wedding gown is a perfect union. From the Langon chapel head outside into the Pontaut Chapter House. The stone benches which surround this outside portal are from a Cistercian monastery and date back to 1151. The Chapter House is where monks would have their daily meetings, where they would sit and pray or meditate on the day. The Heavenly Bodies exhibit is taken outdoors here and places the fashions inside glass cases. This allows the garments to look like they are almost set into the natural elements. The garments in this area of the museum are all inspired by various religious orders. The monastic inspirations can be seen in the simplicity of the garments, as well as their monochromatic colours pallet. Colour is used in religious orders to differentiation the communities. Brown is associated with the Franciscans. White is worn by the Augustinians and Black associated with the Dominicans. Claire McCardell was a designer who donned the term "monastic" for her collection, referring to any garment without a waistline which could be belted as the wearer desired. A few of her original dresses from this collection can be seen in the glass cases outside. While the glare from the sun during certain times of the day can be a bit difficult to see inside the case, it makes the viewer work harder to study the seemingly simple outfits. While they may appear to be very plain the amount of work and precision used to create something this perfect is sometimes more involved than the flashy dresses you saw at the Met 5th Avenue. The seamstresses have an almost meditative mindset they get into the ensure each stitch as a precise as a machine. You are now standing in the central, Cuxa Cloister. The Cuxa Cloister is the open-air courtyard which was the nucleus for the religious order. It is not only where they met but also where they grew herbs and flowers for the community which they supported. The monks and nuns not only acted as religious teachers but were also healers and helpers. They would grow food for the poor who couldn't afford to feed themselves and mend the wounds of the sick and injured. Two of the most controversial pieces in the exhibition are located outside in the covered walkway of the Cloisters. These are by designer Rick Owens’s and while from afar they might look like a modernized version of monks soutanes, up close you can see one large glaring difference. In the centre of their pants in a large "peephole". He was inspired by the drunken monk stereotype from the Canterbury Tales. Owen's was trying to make a statement about man's naughty side and a slight commentary on how inappropriate actions could be forgiven by God. Despite it being a piece from a 2015 collection, it is stirringly appropriate today. From the exterior Cloisters, head back inside to the Early Gothic Hall. 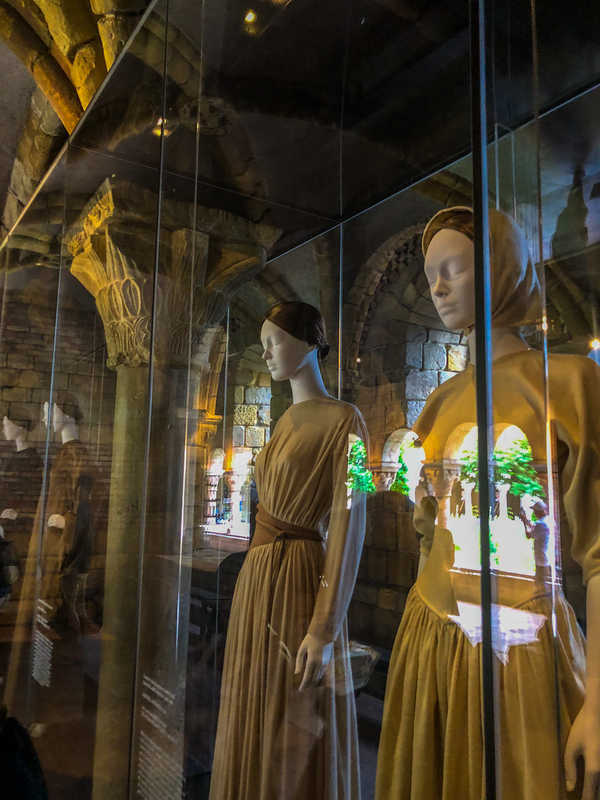 The Early Gothic Hall houses work from the thirteenth and fourteenth centuries but during the Heavenly Bodies Exhibit it focuses once more on the Cult of the Virgin and combines stained glass and wood carvings of the Virgin Mary with gowns inspired by her as well. Along the walls, to the west, you can view gothic stained-glass panels from various English and French cathedrals. Stained glass was of the utmost importance during the Gothic era. It was bright and colourful and yet also allowed light to flow into the church without being diluted or obscured. This was symbolic of Mary giving birth to Jesus while remaining a Virgin. Standing in front of the medieval stained glass is a dress by Jean Paul Gautier titled Lumière. It features a stained glass pattern of the Virgin Mary. A shawl draped over her shoulder was designed in the shape of the baby Jesus, giving the effect of her carrying the child in her arms. The details in the stained glass and leading are so realistic, from afar you might mistake it for a real stretch of glass, not a piece of fabric. The other two dresses in this gallery are also by Gautier, from his "les Vierges" (the Virgins) collection which focused on the Blessed Virgin Mary and the iconography which has always been a focus of her devotions. When paintings, sculptures or statues were created of the Virgin Mary they almost always featured one or all of these four iconic elements; a veil, the immaculate or sacred heart, a halo and the use of the colour blue, specifically lapis lazuli. The blue draping fabrics on both dresses are mirrored in the medieval wooden sculptures of the Virgin Mary. Each of the dresses is also detailed with a red heart. There are so many levels of symbolism in the Immaculate Heart, it is one of my favourite images in Christian symbology. The heart being visible outside Mary's body symbolizes her undying love for the people, so powerful her heart cannot be contained in her body. A row of roses surrounds the heart, roses are a symbol of purity relating to her immaculate conception. Finally, the heart is pierced by a sword symbolizing the eternal sorrow she has for the child she lost. Whether you are religious or not, there is certainly something deeply moving about a mother's pain for the loss of her child. From the Early Gothic Hall, we head downstairs towards the Gothic Chapel. This reconstruction is a modern interpretation of a European Gothic Chapel. Luminous Austrian stained glass climbs up the towards the pointed arch ceiling. Four wooden statuaries stand in prayer below. Two of them featuring a small, wonderfully detailed wooden awning. Placed throughout the room are seven mid-thirteenth and fourteenth-century tombs..
On opposite sides of the chapel we can see the fourteenth-century tombs of two Catalan counts of Urgell. These knights were members of the royal family who took part in the Holy Crusades. The crusades were a series of religious wars sanctioned aimed at recovering the Holy Land from Muslim rule. Going on a crusade was thought to redeem your soul if you feared you carried with you any sin. One of these knights was fabled to have brought back with him a relic of the cross on which Jesus was crucified. The figures of these holy knights are perfectly juxtaposed with dresses by Gareth Pugh and Olivier Theyskens which are found high plinths, whose mannequins look down over their fallen comrades. These garments were designed all black but emblazoned with crosses across their bodices. In the centre of the room are three figures lying in repose. Two are the armoured gisant (a recumbent sculpture of a deceased person shown usually with arms crossed over the chest) knights of the d'Alluye family. The outfits they are wearing for eternity, carved here in stone, are the very pieces of armour and clothing they would have worn in daily life. Garments from this period are extremely hard to come by since most were not properly preserved and have not aged well with the ravages of time. But here, these stone versions are a spectacular example fashion of the time and every little details and embroidery is crystal clear in this dark stone. In the centre of the medieval stones is an incredible piece by John Galliano. This dress was designed to look like a suit of armour, with fabrics layered to appear as plate mail. On one sleeve she dons an enormous piece of metal armour, giving the impression of Joan of Arc. Her headpiece is made of crystals, sewn into malleable metals, in the shape of three crowning dragons. In medieval times dragon was symbolic of independence, leadership and strength and therefore often was important to ancient military iconography. Continuing on through the Basement level, we walk into the Glass Gallery. The Glass Gallery features a row of fifteenth and sixteenth-century silver stained glass lancet windows which look out into Bonnefont Cloister. Since this room looks out into the gardens, all pieces in here are inspired by the Garden of Eden. The Garden of Eden is one of those stories that even if you've never been to church, you know that story. It has high drama and is wickedly visual and as such is a point of inspiration for many designers, even the secular ones. The first dress you're greeted by is right as you walk in the doors is a dramatic dress by Maria Grazia Chiuri and Pierpaolo Piccioli for Valentino. The dress was inspired by a medieval painting by Lucas Cranach the Elder's of the Garden of Eden. Meticulous embroidery brings the iconic scene alive. It feels so delicate and otherworldly. The embroidery featured here is a reminder of some of the incredible embroideries we saw in the Vatican collection at the 5th avenue location. The ways in which those nun's created scenes from the bible to inspire the congregation in church, Chiuri and Piccioli have created that same kind of magical inspiration for their public. Along the length of the glass gallery are a series of trees and hidden amongst them are various dresses by Jun Takahashi's and Raf Simon's for Christian Dior. Each of these dresses is created using a scene from Hieronymous Bosch's triptych 'The Garden of Earthly Delights'. Takahashi and Simon transformed these brilliant paintings into lush and dynamic patterns, complimenting them with modern cuts and striking ornaments. Bosch's triptych is one of the most iconic and powerful depictions of Eden and its imagery so dense and sumptuous that it easily lends itself well to printed patterns. At the end of the row of trees stands one singular dress encased in glass. The dress is made with thousands of gold threads and formed into the shape of wheat, which springs forth from the dress. Wheat is an incredibly important element in Christian symbology. Wheat is the ingredient from which the bread and body of Christ is made and therefore wheat is often used to symbolize Jesus. As wheat is another natural element from the garden it fits in nicely with the rest of the Eden inspired dresses. The next room we enter is the Treasury. The treasury features ancient illuminated manuscripts, prayer books, various reliquaries and precious metalwork objects from the eleventh through the fifteenth century. Often, rich patrons of the church would donate money in order to have works of art created for the church's Treasury. It was a way for them to, in a sense, atone for their sins by funding beauty for the church. Artists were given huge sums of money to create goblets, vestments, books and more. Today, modern artists are just as inspired by these pieces as the public was when they were first created in the medieval times. At the door to the Treasury, you are greeted by this huge and layered blood-red gown. Across the skirt of the gown are painted letters and words. She looks like one of the old illuminated manuscripts come to life. The fashions featured in the Treasury are combinations of secular garments and items which were designed for use in the modern day church. A dress by Dior features a chalice made from layers of lace woven onto the bodice. The lace was used to mimic the incredibly ornate medieval chalices featured in the treasury. A cope created for World Youth Day is located in a case nearby, decorated with a rainbow of crosses and golden embroidery. This modern design is a stark contrast to the medieval treasures but the colourful designs reflect the bright jewels located inside the various pieces. Inside the woodcarvings room, in a glass case, is the silver crown of thorns designed by Shaun Leane, a master goldsmith and metalworker for Alexander McQueen. Metal artisans were seminal to the ecclesiastical artistry of the medieval era. They transformed pieces of iron, silver and gold into otherworldly works of art. And the partnership between McQueen and Leane was similarily transforming in the early 2000s. 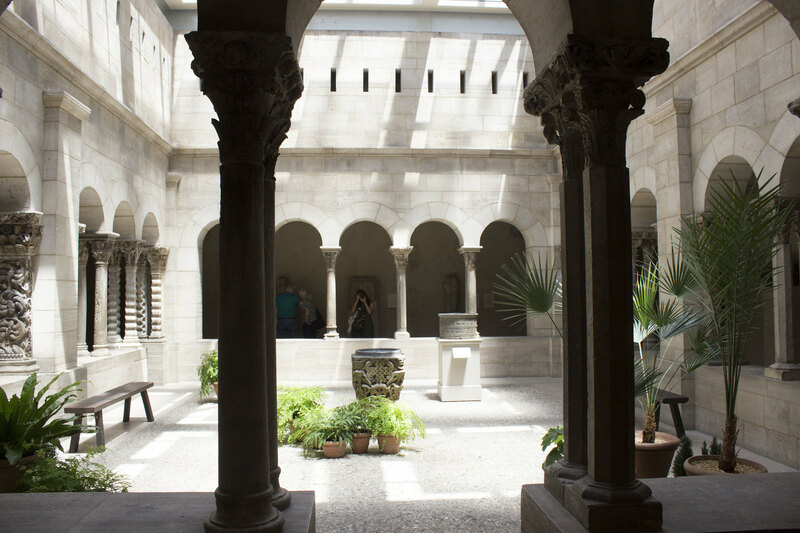 Before heading back upstairs to the rest of the exhibition, take a moment to explore the Bonnefont Cloister. Despite the fact that they do no house any pieces from the Heavenly Bodies Exhibition it is still a gorgeous place to explore. 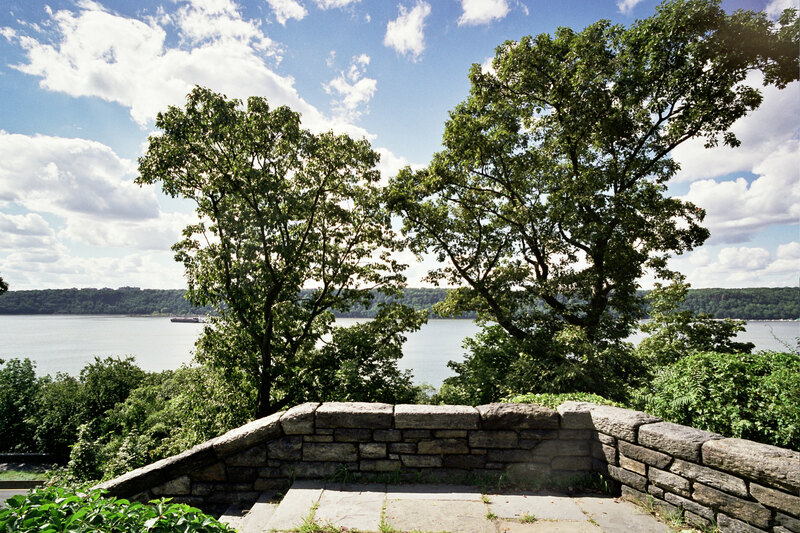 From here you can look over to Fort Tryon Park and the Hudson River. The name of these Cloisters comes from the plant-inspired capitals used throughout which are from a monastery in Bonnefont-en-Comminges in France. Walk amongst the multitude of growing flora. These medieval plants were all used by nuns and monks to create medicine, food and materials for artists who worked for the church. Taking the staircase opposite the Treasury, we return upstairs into the Boppard Room. The Boppard Room's dazzling feature are the six tall stained-glass windows which the name is the room is named after. They were recovered from a Carmelite church in Boppard, France. The glass dates all the way back to 1440. In the centre of the trio of glass windows on the left, we can see the gleaming blue lapis lazuli robe of the Virgin Mary patterned with golden bouquets of wheat. As mentioned before, wheat is symbolic of the body of Christ but when worn by the Virgin Mary, the wheat symbolizes her nourishment of humankind and God's bounty. Inside a glass case opposite the stained glass is a Chanel gown made of silk tulle with embroidered wheat sown into the design, reflecting the design from almost 400 years prior. Sitting in front of the medieval reliquary from the Netherlands, featuring various busts of female saints, are two curved straw hats by milliner Philip Treacy. Treacy was inspired by wimple featured on the television show, “The Flying Nun”. Wimples were medieval headdresses made from a large piece of cloth worn around the neck and chin, and covering the top of the head. Despite having so much movement in the design, the hats are almost weightless, like the wings of an angel. From the Boppard Room, we head into the iconic Unicorn Tapestries room. The Unicorn Tapestries, specifically the final piece of the collection, is perhaps the most well-known image from the Met Cloisters. Inside this rather small and quiet room are seven wall-sized tapestries depicting the story of, "The Hunt of the Unicorn". While the tapestries have faded over time, the details woven in the imagery is still magnificent. The flora and fauna, mythical beasts and costuming of the lords and ladies inside these intricate tapestries give us a glimpse into the life of these medievals royals. The titular piece in the collection is that of the unicorn inside a circular pen, pomegranate juice dripping down from a tree onto the pure white beast. In Christian symbology, pomegranates are an important representation of Christ's resurrection. Religious scholars have compared the unicorn to Christ himself, and the pomegranates juice on the unicorns back to a form of stigmata. In some scenes, you can even see the unicorn with a crown of thorns around its head. Secular interpretations correlate the piece more towards the concept of the bond of marriage. The circular cage represents the wedding ring and the pure white unicorn as a symbol of virginity before consummating the marriage. In the centre of the room is a brilliant white wedding dress designed by Thom Browne. Embroidered onto the dress is the image of a unicorn in gold thread. When walked down the runway it was accompanied by a life-size unicorn puppet. Walk around the dress to see the red threads coming out of the animals back, corresponding to the drops of red pomegranate juice from the tapestry. Since it is a wedding dress the red has also been interpreted as a symbol of fertility. From the Unicorn tapestries, we walk into the Nine heroes tapestry room. The nine heroes tapestry is the oldest in the Met's collection. It features the figures of nine heroes, both fictional and historical. These knights' tales taught people valuable life lessons and attitudes to model your behaviour after. It was meant to be inspirational for the prince for whom the artwork was made for. Inspired by the densely woven fabrics worn by warrior monks, Craig Green created a menswear collection drawn from the imagery of crusading knights. The garment was made from hundreds of woven materials, most of them resembling Islamic prayer mats. Head back outside to enter the Merode Room. This room features the Annunciation Triptych by the workshop of Robert Campin. This piece was created as private devotion for its donor, and the rest of the room reflects this idea of prayer in private spaces. In the centre of the painting is an image of the Virgin Mary, enrobed in red velvet. This design mimics almost exactly the dress by Maria Grazia Chiuri and Pierpaolo Piccioli for Valentino standing in the corner of the room. The sleeves of the dress were made to look like the wings of an angel which were event quilted to look like feathers. The final room on tour is the Late Gothic Hall. It is the largest gallery in the Cloisters and features the most modern (well modern for gothic art I suppose) pieces in the collection. They range from the later fifteenth and early sixteenth centuries and are mostly artworks dismantled from larger altarpieces which were once the central focus of these gothic churches. In the centre of the room is a striking golden dress, which immediately draws your eye. The mannequin stands in front of an old golden altarpiece from Spain featuring images of the Virgin Mary. This dress was designed by Dolce and Gabbana for a devotional sculpture in the church. The dress was also inspired by a painting of Our Lady of Guaopulo from the MET. Our Lady of Guapulo is always dressed in bright gold, her incredible spirit glowing against the darkness. Many of the dress on display are by Alexander McQueen. McQueen drew huge amounts of inspiration from religion. He loved medieval and gothic religious art, the way they used colour and drama, much like his own designs, to evoke emotions and stir the soul. Early Netherlandish paintings especially were incredibly powerful, both for better and for worse. The collection he created prior to his death, Angels and Demons, focused on this subject matter. High on a plinth along the wall, we can see one of McQueen's dresses printed with a panel from a triptych of the Last Judgment, by German painter Hans Memling. It portrays Saint Michael sending the souls of the dead to heaven or to hell. McQueen was always drawn to the darker side of religious art and liked the way it didn't shy away from the sins which humans are prone to making. But all the while also representing the ways in which Christ and the angels are here to help humankind rid themselves of the darkness and bring them into the light. Hieronymous Bosch, which we previously saw used in the Garden of Eden room, is once more used her by McQueen, but this time, the focus of the inspiration is on The Last Judgment and the imagery is darker and more ominous. Along the wall we see two pieces facing one and other. One is a gothic stone angel, the other a dress by John Galliano from his Fallen Angels collection. His angels were ones whose wings had been clipped. He was inspired by classical dress shapes and Greecian fabrics. The way the drapery was created resembles the stone figure so strongly that it seems like here, Galliano has brought it to life. This brings us to the end of the exhibition. There is so much to see but thankfully since the exhibition is running into October there is plenty of time to go back, to study more precisely your favourite pieces, or even just to get lost in the peaceful serenity of the Cloisters.